Interesting opinion. I have had this piece since 1984. Not many fakes being made back then (there was almost no market here in the U.S). I trust these are good enough. Do you also collect Russian Soviet period boards? There are some great examples from that era and they look similar to Imperial boards. I've rarely seen Soviet boards that much up to anything like Imperial quality stuff. Lets be honest, the Soviets weren't big on fancy dress, I think much of the price bump in Russian items of late is due to collectors looks for a nice asctetic who end up paying too much for Imperial items. I've only got one set of these boards, and they're beautufil. I've also got a strange set which looks to be Imperial Russian but I don't beleive to be a shoulder board. Anyway, back to the point, I have a few Soviet general's items and I've felt even low-ranking Imperial items seem to be of much higher quality. And a most impressive collection!!!! Enjoyed viewing all your Czarist shoulder boards , had no idea it is such a vast field with each board displaying a different unit & surface style. If anybody should find themselves visiting the Winter Palace ( across from the Hermitage ) in St. Petersburg Russia, I suggest a visit to the Guards Museum truely a marvel ( located by the columns & parade ground) where many of the uniforms can be seen including some that belong to the Czars. I remember the shoulder boards being ornate & the uniforms were in pristine condition. Shoulder boards of Czar Nicholas II. Colonel-en-Chief, 4th Guard Rifle Regiment of Tsarkoe Selo. These shoulder boards were worn exclusively by Czar Nicholas II. These boards have no cardboard inserts and were made soft for the purpose of sewing to his gynastorka shits. Most photos of Czar Nicholas in the period of 1916 till his death show him wearing a gynastorka shirt with these boards. The uniform of the 4th Guard Rifle Regiment was worn by the Czar throughout WW1. 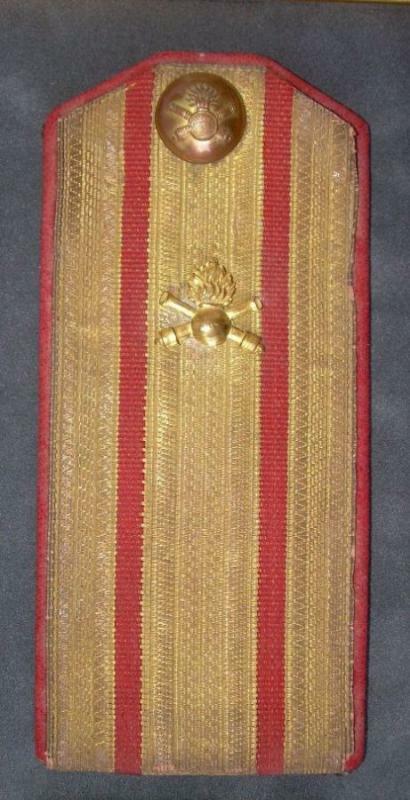 I would like to know if this is the correct shoulder board for Czar Nicholas II ?. Also are these originals ?. Sir, Do you know what this shoulder board for a Senior Sergent would look like ?. I do not think that Regal Uniforma Collector regularly visits this site anymore. I can perhaps answer your questions. First, the Tsar's shoulder boards are real. I have seen them in person and they are wonderful and could have belonged to no other person. Regarding the dragoon enlisted straps, it depends on what period you are talking about. 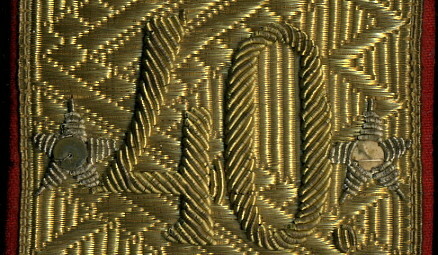 A wartime example from this regiment would have had a shoulder strap in the same color as the tunic/Gymnastiorka with the regimental royal cypher in light blue (device color for dragoons). 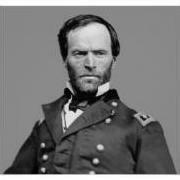 NCO status would have been indicated by the addition of horizontal or vertical stripes or a combination thereof. Great pieces!! I really admire the craftsmanship of the imperial boards. 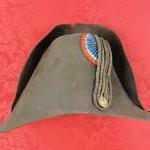 My e-mail is rbhouf@localnet.com also a question for on the Imperial Russian 6th Dragoons where would the star go for a Jr.LT ?. 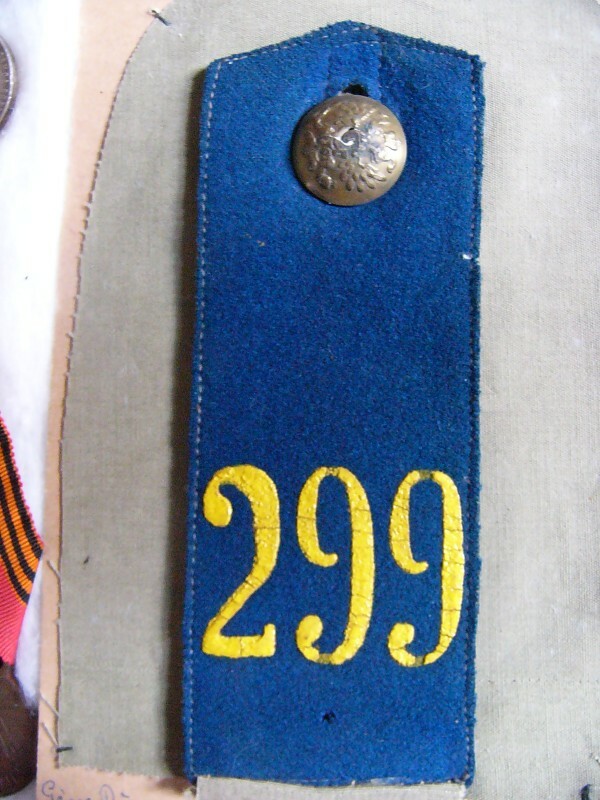 Also do you know of anyone who can make repro German WWI officers shoulder boards and hession sgt collar dics ?. - 1st battery of the Kronstadt Fortress, pre-1912, unofficial pattern for M1881 and M1907 tunics. Very nice examples. Thanks for showing them. Do you specialize in artillery or is this just a sampling? I specialize in Imperial militaria (pre-February, 1917). Shoulder-boards are one of my favorite directions. Should you be interested, I have an exchange fund. Aceton, I'm interested in seeing your fund, but you're unable to accept PM's, can you send me your email address. I have been collecting prewar and WWI Russian items for many years, but have not accumulated a collection the size of my friend, Regal Uniforma Collector (who started this thread). My shoulder board collection consists of approximately 45 pieces, three of which I showed earlier in this thread. I prefer the enlisted man's examples, but here, one has to take what one can get. Most of my items are common and would be of no interest to you, given the nice examples you have shown. Vodorosl, it is at least not a polite manner in which you have interfered the discussion. Chip, I know Greg and I’ve been closely communicating with him several years ago. I have changed my job and my e-mail changed, but I wrote my new contacts to Greg. Sadly, there was no answer. Year ago Greg wrote me from a contact list of American pen-friends website, but he didn’t assumed that as a Russian user I cannot even register there (subscription to that website couldn’t be paid from Russian Visa card, and unsubscribed members cannot read or write PMs). I would be greatly pleased, if you could help me to restore this communication. He told me that he was moving out from CA to a new address, but I think it didn’t refer to e-mail communication. My e-mail is skalon1909@yandex.ru If you write me back, I will gladly show you the whole collection, including the other fine samples of EM boards, and nice range of officers. Aceton, don't want to start a argument, but if you would have bothered to go back and read through the whole thread, you would have seen that I've been in this thread before you joined this forum. My offer was addressed to particular person, and not to the whole world. I know you by participation on Russian militaria forums, and the image is not positive to me. Sorry, I have no plans to waste my time on you - you are out of my sphere of interests. I would recognize that narcisistic, self-indulgent and demeening tone anywhere. It was so good not to speak with you for a couple of years, hope I will never have to converse with you again. 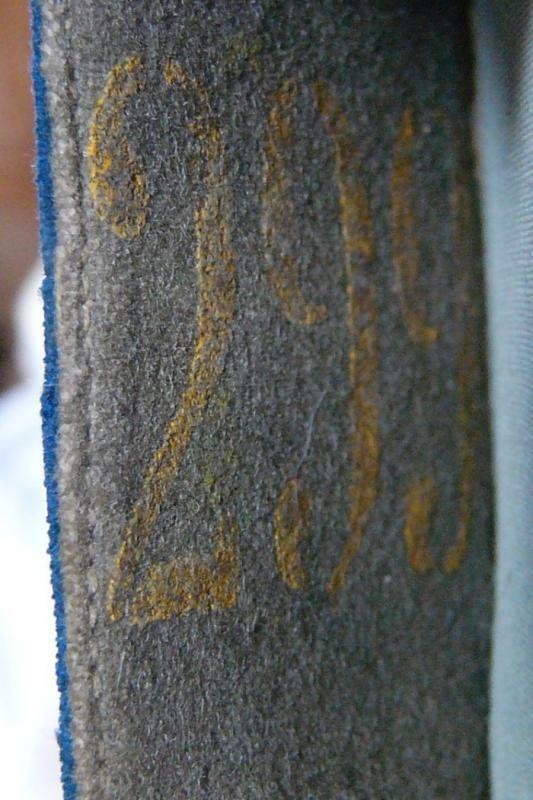 My apologies for interruping, but would any of you have an opinion on what this shoulder board might be? It is on my Great-Grandfather's uniform. I only know that he served ~1883-1888 in a Cossack (maybe just Cavalry) regiment. He was from Bessarabia, but apparently served in the Stavropol region. Standard EM board in blue cloth. The reminds me of one of Regal Uniforma Collector's shoulderboards from his post -#2, center row, far left. His is number "303". My board is sewn down, but when I carefully lifted to look underneath I made an interesting discovery.